Here are some fun photos from the past couple of years. 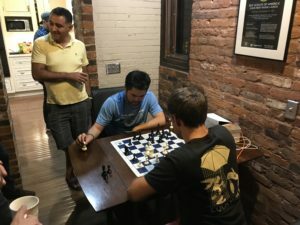 This on was from a late night party at the St. Louis Chess Club after the final round of the Sinquefield Cup 2016. GM Priyadharshan Kannappan was playing blitz with MVL. In 2017 it was no longer necessary to wait until the club closed at night to cut loose. 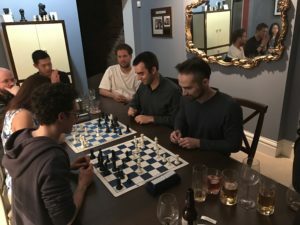 This is at one of the chess houses the club owns and was taken after the final night of the 2017 US Championships. Don’t worry, Mesgen isn’t drinking all of those drinks by himself! 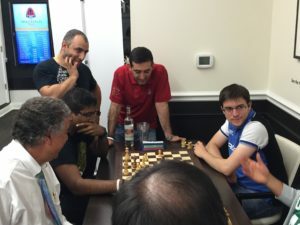 Later that year, after the end of Sinquefield Cup 2017 Naka and Eric Hansen were playing some blitz. Here Aronian has just come and asked Eric to move so that he could get in on the action. One of the more impressive things I’ve seen. Here Hikaru is playing Robert Hess at 1-5 time odds (Hikaru has one minute to Hess’s five). Also after Sinquefield 2017. They played until around 5:00 in the morning. I left around 4:00 and heard from Hikaru the next day that after all was said and done they finished on an even score! Eric Hansen had to catch a flight for Spain early that morning, but stayed all night to watch this, giving himself just enough time to get to the airport. 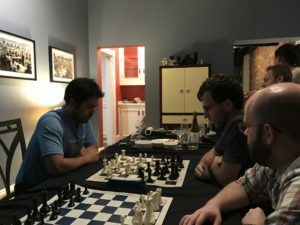 He later said that watching this inspired him and has made him play faster in OTB blitz games. 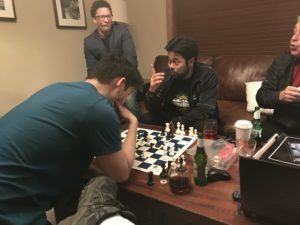 The night before the final round of the 2018 US Championships. Former lineman for the Baltimore Ravens and current PhD candidate at MIT John Urschel is getting an informal lesson from IM Eric Rosen. More Hansen and Naka blitz. This is the next night after the Championships are over. Eric really likes to play Hikaru even though he knows that he’s mostly just “food” in these situations. He is playing on his knees because he just really wants to play. After a few games like this we found him a chair. Funny story, if you look to the left of Eric’s glass you’ll see a xiangqi piece. Two black pawns were missing so Yasser grabbed a couple of pieces out of the xiangqi set. What makes it really funny is that later than night we learned that there were ten spare sets in one of the closets! 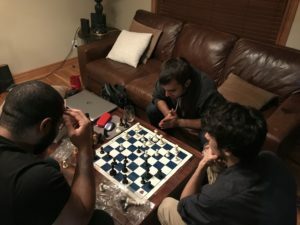 I am so grateful to the chess world for allowing me to have some of these experiences. I’ve made so many friends and had a lot of fun over the years.